Thanks for tuning in to Radio Vet Nurse! Radio Vet Nurse is the podcast for vet nurses where we tell our story. Read more about your host, Cat Robinson here. In this episode I caught up with social media super nurse and all round lovely human, Lou the Vet Nurse. If you don’t already follow Lou on Facebook or Insta, you should. Her social media content is full of vet nursing tips and positive inspo. You can find a link to Lou’s social media and everything else we discuss in these show notes. Lou is an RVN in the UK with a special interest in intensive nursing and anaesthesia. In addition to active nursing, Lou is the clinical nurse lead at her practice. She’s responsible for monitoring and reviewing clinical standards and mentoring the nursing team in line with her additional qualifications. Lou has some great ideas about how to work at improving firstly our own skills and knowledge as individuals, and secondly the standards of care of the veterinary health care teams as a whole. She is also a huge advocate for vets and nurses working together and sharing ideas. Whether you’re listening to Lou in this interview, or enjoying her social media content, it’s obvious that she is all about encouraging vet nurses to appreciate their self-worth and to go out and create the careers they’ve always wanted. It’s inspiring to hear another vet nurse speak this way and to promote what is becoming a reoccurring theme on this podcast; that we are qualified, knowledgeable professionals, and our voices are worth listening to! In this episode you’ll hear from Janet, the President of the Vet Nurse Council of Australia (VNCA). Janet is from New Zealand, currently living in Perth, and is a lecturer in vet nursing at South Metropolitan TAFE. Janet has been nursing for 20+ years and has multiple qualifications including a Bachelor in Veterinary Nursing and an Associate Degree in Adult and Vocational Education. Janet’s career has taken her all over the world including specialising in Emergency and Critical Care at the Royal Veterinary College in London. Janet recently travelled to the VMX conference in Orlando Florida as the only international recipient of the Dr Earl Rippie Veterinary Nurse Leadership Scholarship. This scholarship recognizes veterinary technicians and nurses who demonstrate leadership abilities and make a positive impact on the growth of the profession. When you hear about Janet’s involvement with the VNCA and the upcoming launch of the AVNAT scheme it will be obvious why she received this scholarship and was then treated like vet nursing royalty at VMX. Janet has had a massive year at the helm of the VNCA and I can’t wait to see what she does next. · RECOVER basic life support and advanced life support workshop. Online RECOVER course available through the VNCA as a membership opportunity. Available on all of the major podcasting platforms. New episodes drop on the 1st Monday of the month. In this episode you’ll hear from Natalie, the Academic Director of the Australian College of Vet Nursing. Natalie has Certificate IV qualifications in veterinary nursing, canine behaviour, training and assessment, and Diplomas in vocational education and training, surgical nursing, and emergency and critical care. When I listened back to this interview it occurred to me that Natalie is an extremely empathetic person. So much of what she has to say comes from a place of sensitivity towards how another person, or animal, is feeling. This natural proclivity towards empathy is a perfect fit for Natalie’s passion for canine and (more recently) feline behaviour. Behaviour is also one of my favourite areas so I loved geeking out with Natalie on this topic. Natalie’s career moved from clinical nursing to academia following the loss of a very special dog and the cascade of events that followed. I’m really grateful to Natalie for talking about this and other topics with a level of honesty and vulnerability that I know was not easy. These experiences underpin Natalie’s drive to empower other nurses to recognise and manage stress and compassion fatigue; which is of course an essential part of our story. The Canine Good Citizen certificate through the DELTA Institute. In this episode you’ll get to know Hayley from the Animal Emergency Service (AES) in Brisbane. I’ve been wanting to get the emergency nursing angle for a while now because I think it’s a really exciting part of our story. I reached out to Dr Alex Hynes who is a senior vet at AES and one of the new vets on the iconic Bondi Vet TV show (side note: it’s back, channel Nine, this year. You’re welcome!). Dr Alex recommended Hayley as one of AES’s most senior emergency and intensive care nurses. As a veterinary technician and nurse in the Pet Intensive Care Unit Hayley helps treat the most critical of patients. If you do watch Bondi Vet this year you’ll probably see Hayley, doing what she loves, caring for patients in the ICU. Which also makes her a reality TV vet nurse! Hayley’s been in the industry for over 20 years but is absolutely brimming with enthusiasm. Particularly about nurse empowerment, team work with our vets, and utilizing nurses to the best of our ability. Hayley and I are both talkers, and we also just clicked, so this is one of my longer episodes. Hayley completed her certificates in veterinary nursing with the Animal Industries Resource Centre and obtained a Bachelor of Applied Science (Veterinary Technology) at the University of Queensland. We also discussed the DISC Profile as a way to better understand your team. In this episode I catch up with a well-known vet nurse and presenter in Australia, Sue Crampton. Sue is such an accomplished person; she’s the owner and founder of Crampton Consulting Group and the Animal Industries Resource Centre and - in addition to vet nursing - has a really interesting collection of qualifications including Bachelor of Business, Diploma in Company Directorship, and Masters in Neuro Linguistic Programming. 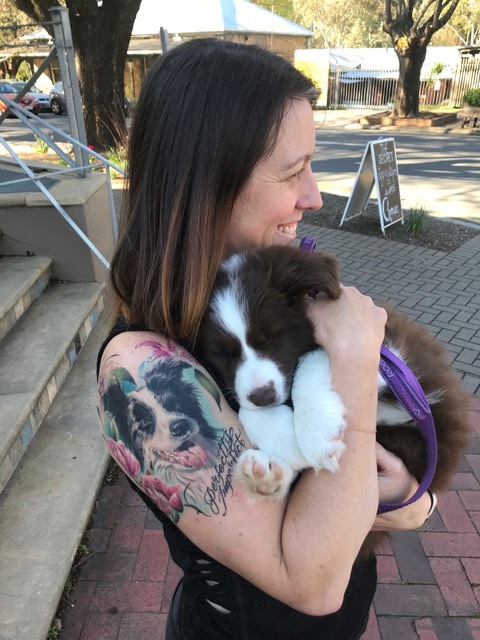 As one of Australia's leading veterinary educators she’s on the go both in Australia and overseas two to three weeks of every month. It’s highly likely you’ve seen her present. I first saw Sue at a conference in 2014 and, for me, it was an absolute game-changer. I was almost a year into owning and operating Ready Vet and studying my cert IV, but telling myself I was just doing the study to better manage my business. As someone who had been to uni for almost a decade for a different career, I was trying to suppress the growing suspicion that I actually loved vet nursing. But when I watched Sue present it really sealed the deal for me. She was speaking my language 100%, motivating and inspiring me, and I had this light bulb moment; yep, I am a vet nurse, and I love it. It’s hard to say what it is about Sue that enables her to connect with people and inspire in this way, but I think it’s this: she has this ability to identify and articulate the fundamentals of our industry, chunk them down, and present them within this framework of the veterinary health care team, rather this unhelpful binary of vets and nurses. It’s been four years since I first enjoyed Sue’s presentation at that conference, and I really enjoyed catching up again.